City of Ghosts follows the journey of “Raqqa is Being Slaughtered Silently” - a small group of anonymous activists who banded together after their homeland was taken over by ISIS in 2014. 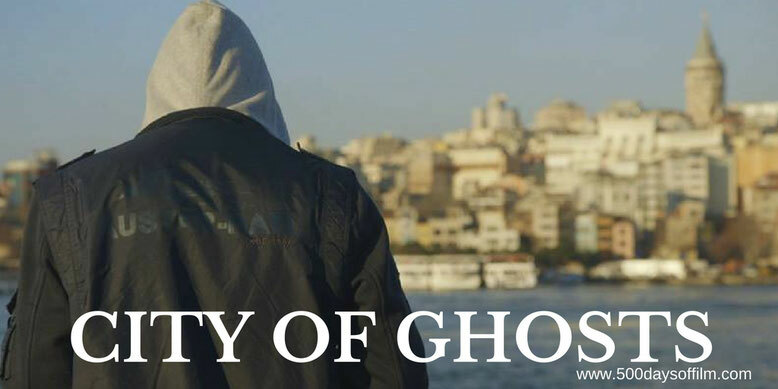 With stunning, deeply personal access, City Of Ghosts tells the story of these brave citizen journalists as they face the realities of life undercover, on the run, and in exile, risking their lives to stand up against one of the greatest evils in the world today. I'm sitting here watching my cursor flash as I attempt to write a review for Matthew Heineman’s powerful documentary, City Of Ghosts. The trouble is, I can’t seem to find the words that will do justice to the film I have just seen. However, I know I have to try because this is a film I want to champion. A film that, despite been a tough and often shocking watch, demands to be seen. That, it seems to me, is the very least I can do in support of Raqqa Is Being Slaughtered Silently (RIBSS). City Of Ghosts follows RIBSS’s group of astonishing citizen journalists as they document the terrifying destruction of their home by ISIS. Working in incredibly dangerous conditions, the footage that we see is astounding - putting us on the ground at the very centre of unbelievable violence, chaos and conflict. Like in his previous documentary (the superb Cartel Land) Heineman does not hold back in City Of Ghosts (the documentary is rated 18 for good reason). We see executions and the severed heads of those who have fallen foul of ISIS. However awful and upsetting, these scenes feel necessary (and never exploitative) for us to understand the situation in Raqqa. Heineman shows us the sacrifice made by RIBSS journalists. They live under the real and constant threat of death. All have lost family and friends - sometimes as a direct result of their reports. Nowhere is safe - nowhere offers a place of refuge. City Of Ghosts also examines what inspires these reporters to persevere with this dangerous work. Their existence is so unbelievably challenging (it feels like an alien world) that it is hard to imagine why any of them would want to continue living this nightmare. However, RIBSS understands the power of the media in this fight for survival. This is why they have been targeted by ISIS. This is why they are being threatened. Their reports are making an impact and, crucially, raising awareness. Their story is powerful and important. At the end of City Of Ghosts I was left with a question - what do we do now? RIBSS is holding out a baton to the world - are we brave enough to take it? Or will we shake our heads and (as the film shows) ease our conscience by handing RIBSS awards for their exceptional journalism. Awards that, while absolutely deserved and appreciated, seem ridiculous (and almost insulting) in the face of what these men have gone through. My cursor flashes once again as I consider this question. Only one thing seems certain, there will be no easy answers. Have you seen City Of Ghosts? If you have, what did you think of this documentary? Let me know in the comments section below or via Facebook or Twitter (@500DaysOfFilm).